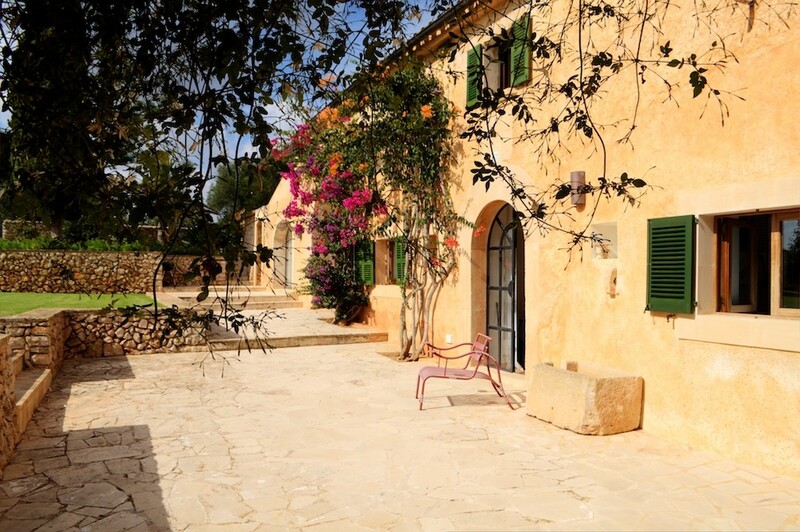 The restored finca lies between the villages of Alqueria Blanca and S’Horta, in the southeast of Mallorca. From the ruins of a 200-year-old building a modern house of approx. 300 m2 is built in Mallorca style and with all modern conveniences. The entrance hall we find the old staircase to the top floor and a guest toilet. The ground floor hosts a cozy living room with chimney, a dining room, a fully equipped kitchen with vaulted ceiling. Furthermore, there is a utility room, an office, a library with outdoor access and another living room from where a staircase leads to a bedroom with bathroom en suite. On the top floor there are three double bedrooms and a bathroom. Furthermore, it is possible to build another bedroom with bathroom. The interior design is of highest quality with the terracotta tiles on the floors, central heating, water and electricity from the town. The outdoor area of the house is laid out beautifully with old olive trees and other Mediterranean plants. The pool of approx. 96 m2 invites to swim and relax. The views of the Mediterranean landscape stretch from the mountains to the sea. All in all this house is a very special place in Mallorca, where relaxation and tranquility are guaranteed. If you are interested in this property, please feel free to contact us by phone (+34 971 064 989) or using the form below.